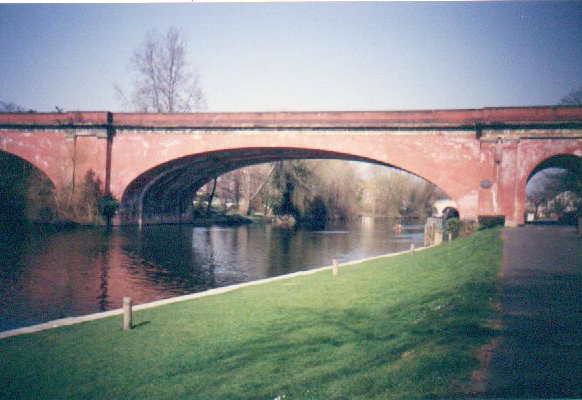 Built in 1838 the two arches of Maidenhead Railway Bridge are the widest and flattest in the world. Each span is 128 feet (about 39 metres), with a rise of only 24 feet (about 7 metres). It is testimony to the genius of Brunel that such a bridge with such flat arches was not only built but continues to carry the Great Western Railway main line from Paddington Station to this day. At first, the board of the Great Western Railway did not believe that the arches would stay up under the weight of the trains and ordered Brunel to leave the wooden formwork used to construct the arches in place. However, Brunel simply lowered the formwork slightly so that it had no structural effect, but appeared to be in place. Later, when the formwork was washed away in floods, but the bridge remained, the strength of the arches was accepted. When built, the bridge carried two lines of Brunel's broad gauge track. Subsequently the bridge was widened, and now carries the four lines of standard gauge track. In the novel 'Is', it is this bridge and its design that leads to the first of Isabel Williams' increasingly loud confrontations with her teacher Mr Philips. To read an extract click here.